Some people keep guinea pigs or hamsters as pets. 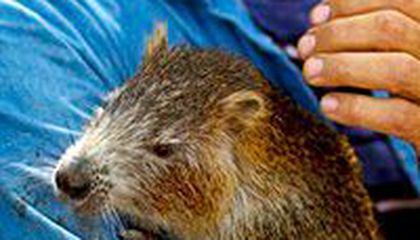 But in Cuba, where a larger, more exotic rodent runs wild, Ana Pedraza and her husband prefer the hutia. With a rope-like tail and long front teeth, the hutia looks like a giant rat. Only it's cuter, some would say. The animals live in Cuba and other Caribbean islands. They are sometimes hunted for food. But Pedraza and her husband Rafael Lopez say they only want to protect and take care of the animal, which measure nearly a foot long, with the largest ones weighing in bigger than a small dog. The couple began collecting hutias about five years ago. They picked up one that was languishing on a roadside. They named her Congui. They found her a mate and now have more than a half-dozen hutias in their home about 25 miles east of the capital, Havana. Congui and her brood like to drink sweetened coffee and munch on crackers and vegetables. Critical thinking challenge: Why arent hutias popular in the U.S.? Would you pay to put your music on the moon? This is a summary on It's a pet in Cuba,. The animals name is hutias It's about 1foot long. In Cuba one family has more than half-dozen! They like to save these animals because some people like to hunt these pets. they look like a gaint rat. that is my summary on It's a pet in Cuba. I think that the animal in the article is a capybara. They are the largest rodents in the world. They are also from south america so it makes sense that it is in that area. because in the w.s. there's already dogs cats and people in the u.s. don't just let there dogs run wield like they would have to do for the animal also the animal is from Cuba and it should have land to run free but it wouldent have that freedom if it was in a city like New York . The hutias looks like a giant rat but it also looks pretty cool. According to the text it says, "The largest hutias weighs bigger that a small dog. Why do the hutias get hunted for food? Why do they like to eat crackers, vegetables and drink sweetened coffee? That is pretty cool how the hutias like to eat crackers, vegetables, and drink coffee because my family love to drink coffee and eat crackers and vegetables. I think hutias aren't popular int he U.S because they look like big rats. Small rats aren't even welcomed in the home of American citizen. Girls will be terrified of the creature and most likely no one would want a giant rat sitting on her feet while their watching TV or eating. It looks so cute, but one question is it harmless.Because if it is than I'm packing my bags to go to Cuba to get me one.The reason why they aren't popular in U.S. is because they don't live there. I don't think the hutias animal is popular in the U.S. because to me it looks like a rat. If we did have them here, I would hope people would like them and take care of them like the people in Cuba. Why is that a pet? it looks like it should remain in the wild, not in someones house. Its just a big rat that people want to have as a pet. 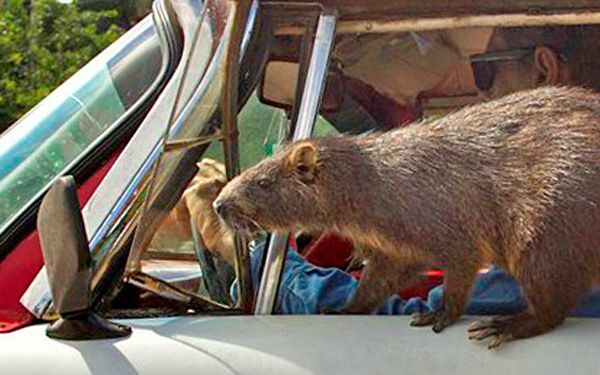 That rodent in Cuba is a lot bigger than a guinea pig or hamster. Also they must be large because they weigh more than a small dog, and are about a foot long. I didnt know they were hunted for food also. These animals lik to drink sweetened coffee and munch on crackers and vegetables just like humans.